I was on my way to SoCal once again, scheduled to pick up my daughter at UCSB on Friday and then meet up with Mom in San Diego for the long weekend. 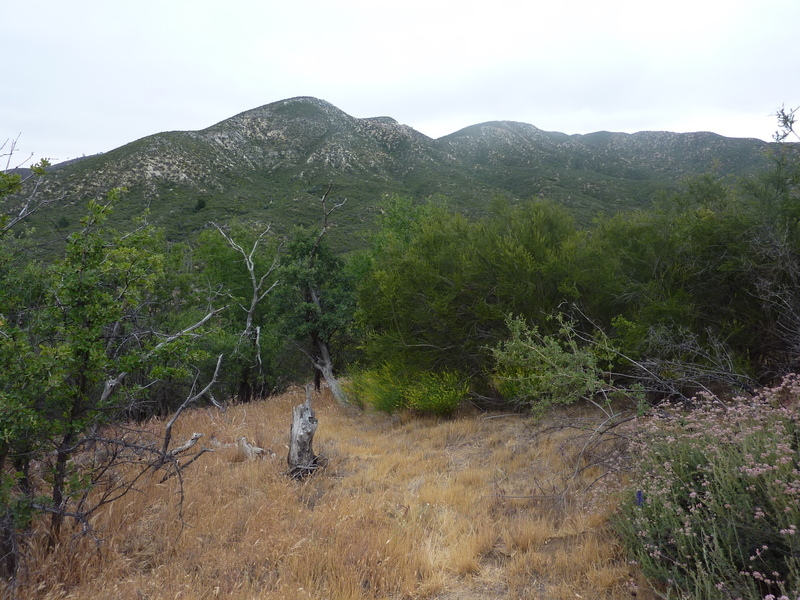 Having mostly recuperated from my mini-ordeal two days earlier in the Ventana Wilderness, I headed further south to San Luis Obispo County to do some (much) easier peakbagging in the La Panza Range and other nearby locales. None were difficult, the longest about 2.5mi one-way. All of them had trails of some sort. The northern part of the range between Pozo and SR58 is a large OHV complex, so there are lots of jeep, ATV and motorcycle tracks, with several campgrounds in the area. I had the place to myself today which was nice since I was walking motorcycle tracks and practicing on some of the intermediate trails with the Jeep. Overcast skies ruled the day, temperatures never exceeding 55F - good for hiking, not so good for views. Great fun, today. I drove some scenic country roads from US101 at Paso Robles to SR58, then found the entrance to the OHV easily enough, well-signed. The main road between SR58 and Pozo is easily driven by any high-clearance vehicle when open, though some of the side roads require 4WD or ATV/motorcycle. I was able to get within 2.5mi of La Panza BM, parked, then hiked the 5mi roundtrip to the summit and back on a motorcycle track. It was pleasant enough (nice not to run into motorized traffic), going through chaparral-covered hills, a fire having burned what trees existed some years past. At the summit, I was unable to locate the benchmark (the trail goes right over the top), though I did find one of the nearby reference marks. I took a few pics of the poor views before heading back. Lots of flowers helped make for more colorful photos. Found about 4mi WNW of La Panza BM, this unnamed summit is less than 2mi from the main road. I drove a Spur Jeep road (labeled "easy") about half the distance to the summit before parking off the side of the road, just below the SE Ridge. The ridge has an old motorcycle track on it (that still sees occasional use, despite the USFS efforts) to make most of the hike brush-free. Only the initial 100ft up from where I parked was cross-country, though only the yucca proved to be any sort of obstacle. The old track goes all the way to the summit where an old fenceline can be found going over the highpoint. Clouds once again muted the views. This was the most interesting. The summit is found less than 2mi from the saddle where dirt Navajo Rd meets paved Black Mtn Rd. A spur jeep trail (labeled "intermediate") goes to the summit with some pretty impressive ups and downs along the connecting ridgeline to get there. It was the first time I needed to use 4L, the first time I hit bottom more than just a tap, and the first time I was glad I had a hill descent mode. I was surprised how well the Jeep climbed and descended with very little slippage. Really, really fun. I parked just below the large summit rock found at the top, providing another welcome surprise. It's stiff class 3 from the southwest side, more like class 2 around the back on the north side. I went up the easy way and down the hard way just for fun, on surprisingly solid conglomerated rock. If I thought the views were poor before, they were non-existent now, with clouds blowing over the summit and ridges, making it difficult to see the Jeep only a hundred feet away. I returned to saddle and drove the paved road down to Pozo, then a few miles through the pastoral valley before turning left at the USFS ranger station to drive up to Hi Mtn. Here, there were actual trees that the other parts of the range I'd visited were missing. Large, spacious oaks with green grass underneath, and no small measure of poison oak found in the understory. Good thing there was no real cross-country today. I was able to drive almost 6mi up the mountain, stopped by a locked gate 1/3mi from the summit, once again socked in by clouds. I had been up to this P1K years earlier with my daughter, starting at 5:30a so she could experience her first hike by headlamp. On the drive for that visit we had been stopped at the campground about 2mi down the road, but today that gate was open. I had come back to pay a visit to the Santa Lucia Wilderness HP which was located just below the summit lookout a few hundred feet to the southeast. It turned out to be mostly a bust, as I found no register or other marker on this "liner". I was happy to find a trail through the brush that made the walk easy enough. I actually went several hundred feet past the Wildreness boundary, just to be sure. Of course, no views. There's a fine, scenic trail up to Hi Mountain from the southeast starting at the small pass on the road. I have camped at the large pullout there more than once and had a peaceful night. The trail is 2-3 miles each way.